Genesis is a concept of leisure vehicle developed in order to give humans the possibility to live a memorable experience by exploring extraterrestrial grounds. The idea of recreating earthlike activities in such different environment holds two major aspects; tourism and socio-economics. To begin, tourism enables those who enjoy extreme outdoor activities to experience something familiar from a whole new perspective. 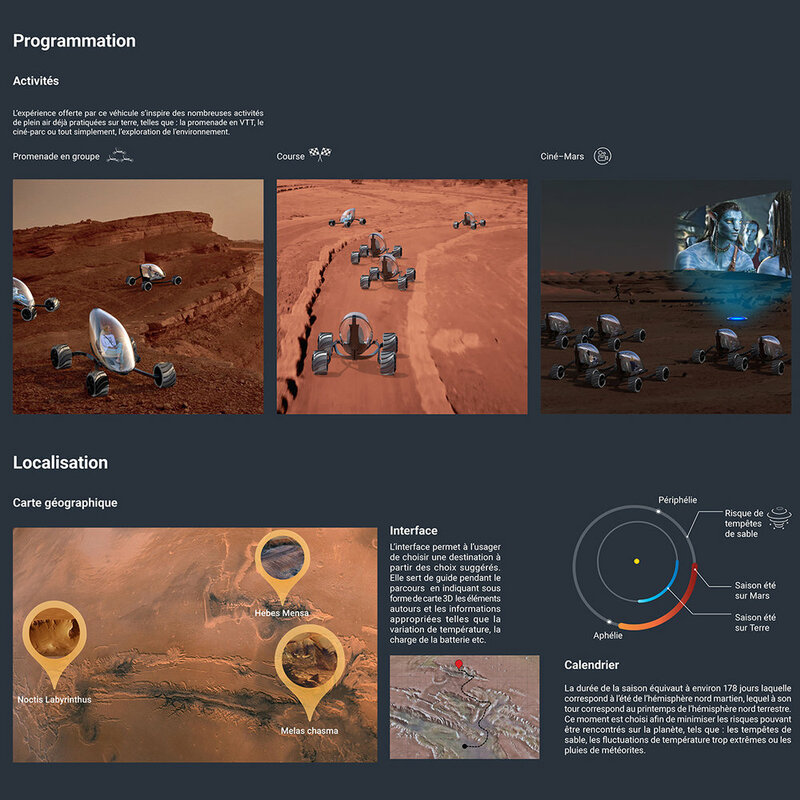 Socio-economical aspect of the concept will enable the creation of a new economy based on tourism which first goal is to increase the interest of humans for the Martian environment. Based on these aspects, it can be estimated that the demand for interplanetary trips will increase and create an interest for transportation infrastructure expansion. Moreover, three secondary aspects are also of huge interest, they consist on familiarizing the users with a new environment, creating an interest for future permanent installations and offering an amusement platform for the residents, composed primarily of scientists. Potential users of the vehicle are tourists from earth whose experience can seduce potential visitors.These same tourists will receive training during the trip that will explain the operation of the vehicle, the organizational logistics, the restrictions and regulations as well as an overview of the many activities in which they will be invited to participate on site. Once arrived at destinations they will be welcomed by a team already living on the spot also hired to take care of vehicle maintenance and facilities. These will accompany them throughout their stay in order to guide them through their recreational experiences. 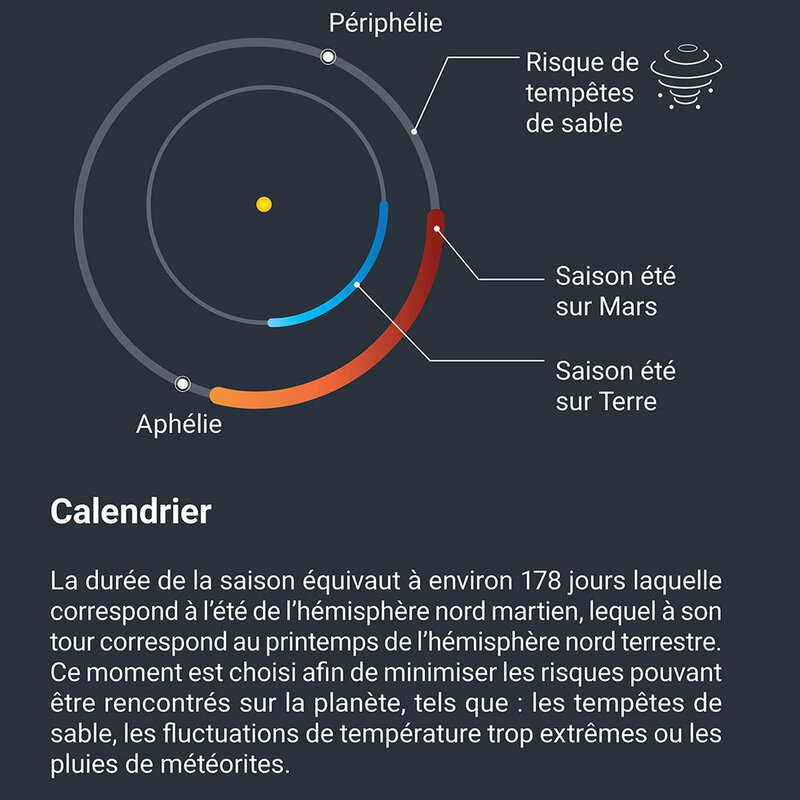 Season’s length is equivalent to about 178 days which corresponds to the summer of Martian’s northern hemisphere, which corresponds to spring in the northern hemisphere on earth. This moment is chosen to minimize the risks of hazardous encounters , such as: sand storms, too extreme temperature fluctuations or meteor rains. Genesis is a multifaceted vehicle which is both autonomous and controllable. 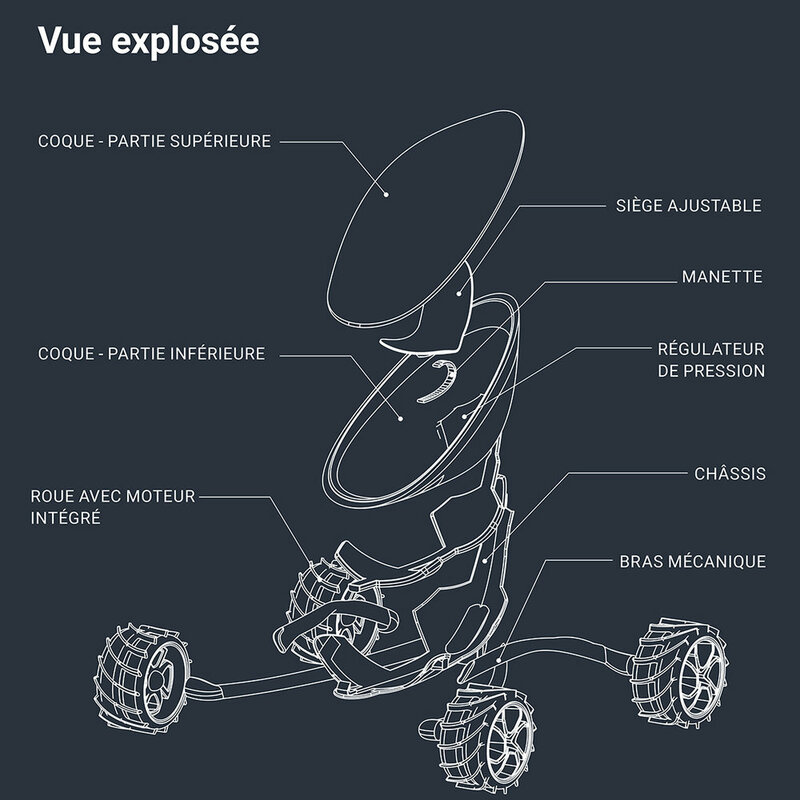 The vehicle allows to be free from any kind of additional space suit, which embellishes the mobility of the user and, in doing so, increases the quality of the user experience. Shell: The shell is the main structure of the vehicle. It is characterized by its egg shape made out of a transparent and rigid polymer composite that has the objective to offer an overview of the external environment. The shell maximizes the feeling of freedom similar to the one the user might be feeling on earth . It also allows users to immerse themselves in the Martian environment to a degree of closeness never reached before. It is insulated with a layer of transparent liquid that ensures protection against cosmic rays, UVA and UVB rays, extreme temperature fluctuations and shocks caused by flying debris and atmospheric composition not well adapted to humans. The vehicle’s door opening system is similar to an oyster shell. Wheels: The vehicle has four identical wheels with mechanical teeth for optimal adherence to the earthy ground. They are connected to the vehicle by a mechanism of central pivot which spreads in the form of legs and allows their mobility according to two axes. This mechanism allows to control the height and width of the vehicle according to the shape of the ground. Seat and joystick: The seat located at the center of the shell can be adjusted according to the selected mode. In Active mode the user seat rises in order to offer a better position of control while in passive mode it backs down to provide a greater sense of relaxation. It is equipped with an arm rest that gives access to the remote control. Joints: Sealing of joints to the assemblies will hold water in the shell and avoid any exchange between the internal and external gas from the outside and inside of the shell. 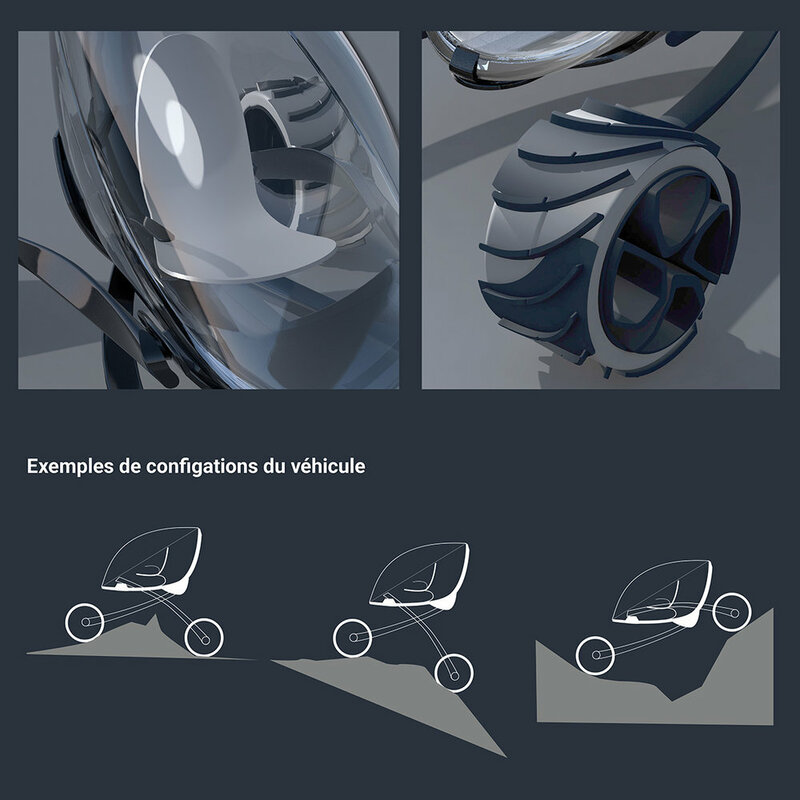 Charging of oxygen : A conceptual system of capsules has been developed in order to recreate a micro-atmosphere inside the shell with different gases and ensure breathable air for the user during his leisure travel. Battery: The vehicle’s battery is charged by induction on an independent platform, which is powered by electrical energy from the central solar-powered station. This allows to power the vehicle for a sufficient amount of battery charge which lasts about as long as the duration of one trip. An environmental contribution is added to the concept because solar energy is a source of renewable and sustainable energy. Interface: The interface allows the user to choose a destination from the suggested choices. It serves as a guide during the journey indicating in the form of 3D map the surroundings and appropriate information like temperature variation, battery charge etc. Configurations: Several configurations are possible thanks to the pivot points on four corners of the vehicle. The configurations system allows the vehicle to occupy minimum space during storage and adapts to very chaotic and unpredictable land. It allows to sneak in a narrow hollows and to raise the vehicle to avoid obstacles . 1. Vehicles are located in a pressurized underground station which also corresponds to a vehicle maintenance garage. This garage contains several charging stations and maintenance equipment. 2. Once battery fully charged, users can enter the vehicle. To do this, they simply open the shell using a voice command. 3. The user can seat in the vehicle. The closing system is also controlled by voice command. 4. The user has the possibility to choose his mode of preference, either passive or active. 5. When it comes to active mode, users can use the joystick to move. 6. In passive mode, the vehicle moves independently to destination. It is also possible to choose the speed in order to enjoy the trip or travel directly to destination.